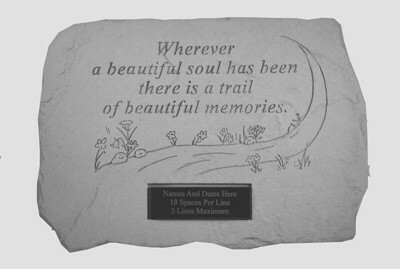 Home > Memorials > Memorial Stones > Personalized Memorial Stone - Wherever A Beautiful Soul..
Memorial stone can be personalized! The memorial stone has a rich texture with the look, feel and weight of true stone. Made of cast stone, it is weatherproof and has year-round durability. Made in USA. Engraved: "Wherever a beautiful soul has been there is a trail of beautiful memories." Memorial Stone - You Will Always Be In Our Hearts..